California’s recent cannabis explosion is expanding the array of edible options. Gone are the limited days of sugary cookies, krispies and brownies – not exactly great for everyday eating. While I still love these sweet dispensary confections, it’s nice to have a more nutritious snack option. 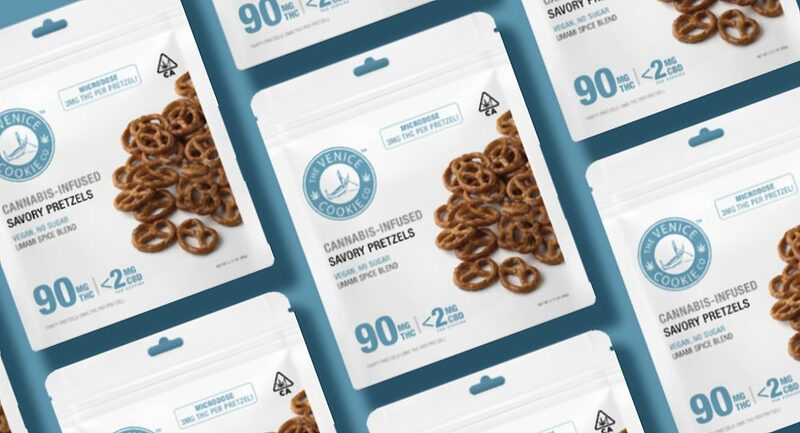 One of the more popular options on the market are these vegan, sugar-free cannabis-infused 100mg savory pretzels by the Venice Cookie Company (VCC), a California company that’s been creating an eclectic array of edibles since 2008. Each batch is lab tested, contains consistent cannabinoid content, made with “consciously curated” ingredients, bold flavor and attention to dietary needs. Venice Cookie Company is one of the most trusted and known cannabis companies around. In this detailed review we’ll try their savory pretzels and determine if they live up to that sterling reputation. Frankly, the packaging is a bit underwhelming, which is unfortunate because the unique concept of cannabis-infused pretzels could be marketed better. The only real design element is a large sticker with the light blue Venice Cookie Company logo and a photo of the pretzels. A picture of pretzels? For pretzels? Groundbreaking. The plain, white, resealable bag has all the necessary compliance information like total potency (100mg THC), total pretzels (33) and dose per pretzel (3mg THC), ingredients, nutrition facts and government warnings. At least a third of the back label explains the brand background and ethos rather than a detailed breakdown of cannabinoid content, strains used, extraction process used or other relevant info I’d like to know. Basically, their labeling is like going on a date with anyone in Hollywood; you’ll get an earful about yoga, spin classes, their “acting career” and that’s about it. But there is a COA (Certificate of Analysis) reference number to look up testing results from SC Labs. So I did. Turns out my bag of pretzels actually contains 104.09mg of activated THC along with CBD, CBN and CBG. It takes an extra couple of steps but if you’re interested in seeing exactly what you’re consuming, do it. I love Chex Mix Bold Party Mix, so these pretzels are up my alley. They look and taste just like any other bite-sized, knotted snack you’d find in the grocery aisle: crunchy but dry. The flavor is everything I expected: salty, garlicky and savory. And don’t be surprised to find some broken pieces at the bottom, making it tough to accurately dose if needed. Try pouring the entire bag into a bowl so you get all the bits, crumbs and seasoning trapped at the bottom (don’t be afraid to lightly mix with tongs so they’re evenly coated) and, like figuring out the meaning of “covfefe,” enjoy! The biggest issue with these cannabis-infused pretzels? Three or four aren’t satisfying enough! I could see myself eating a half or even the whole bag since they’re so tasty. Plus it’s unclear exactly what’s infused: the pretzels themselves or their coated seasoning blend (there’s some left in the bag)? Looking at the ingredients, it appears the seasoning mix is infused. An hour into eating nearly the whole bag, about 90mg, I felt a mild “edible high.” That seems like a lot, but I have strong tolerance and haven’t eaten lunch. Turns out these cannabis-infused savory pretzels produce a mellow high that made me sensitive to light, scarf down dinner, and feel a nice fuzzy hue. Passing the two-hour mark I expected this experience to peak at any moment, but it never did as the mild effects maintained throughout the evening. I presume this is because much of that seasoning ended up at the bottom of the bag, not in my belly. Get in my belly! Knowing the effects are minimal and manageable, these salty and somewhat spicy snack treats are great if you’re looking for a familiar and tasty entry into edibles. The $22 price, however, is a bit steep considering you can get an infused artisanal chocolate bar for about the same cost. Packaged in a generic, white, child-resistant Ziploc bag that won’t crush easily. Some broken pretzel pieces and seasoning at the bottom of the bag. Pleasant branding and graphics affixed with a giant sticker on both sides of the bag. A brand like Venice Cookie Company should have custom bags. Labeling is sufficient; includes the approximate THC content and pretzel count. Backside includes government warnings, ingredients list, nutrition facts, best by date, a note about the brand’s “vibe,” a sticker with SDPharmLabs.com and a verifiable COA number. Test results I found online showed 4.09mg more of activated THC than advertised on the label. No info about CBD, CBN and CBG or other cannabinoids on the package. Easy to approximately dose, but becomes harder with broken bits. Bag encourages microdosing with a couple of pretzels but if you’re hungry and need a higher dose, eating the whole bag can be easy. 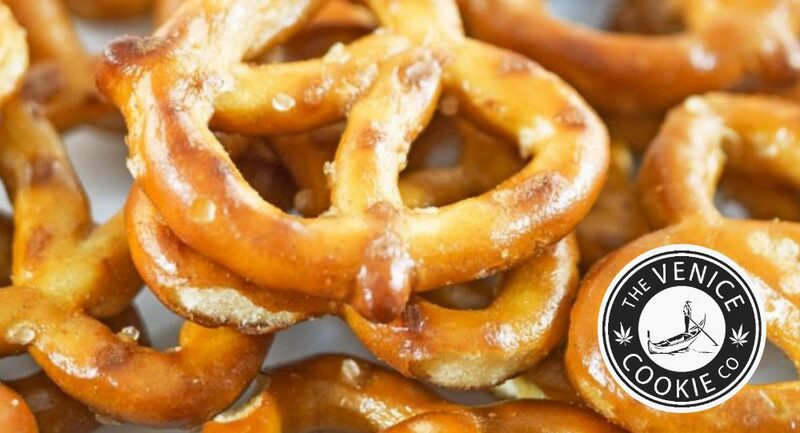 Toss these pretzels in a Ziploc baggie and no one would have a clue you were consuming cannabis. The bag itself is easy enough to overlook. Someone might see the words “cannabis” or “THC,” but the letters are small enough to cover with your hand. I enjoyed these savory spiced pretzels but a friend hated the spice blend. Heavy on the garlic powder, like my mom’s cooking, and reminded me of Gardetto’s snack mix. Exactly what you’d expect from a seasoned bag of pretzels. Crunchy and dry with the powdery seasoning to add a kick of flavor. Seasoning will coat your fingers by the end of your munch session (warning: crumbs). I consumed around 90mg of these pretzels and felt a mild “edible high” an hour later. Feelings of bodily comfort; a nice fuzzy hue becomes a part of my perception. I kept expecting to peak but it never came; the high stayed mild the rest of the night. 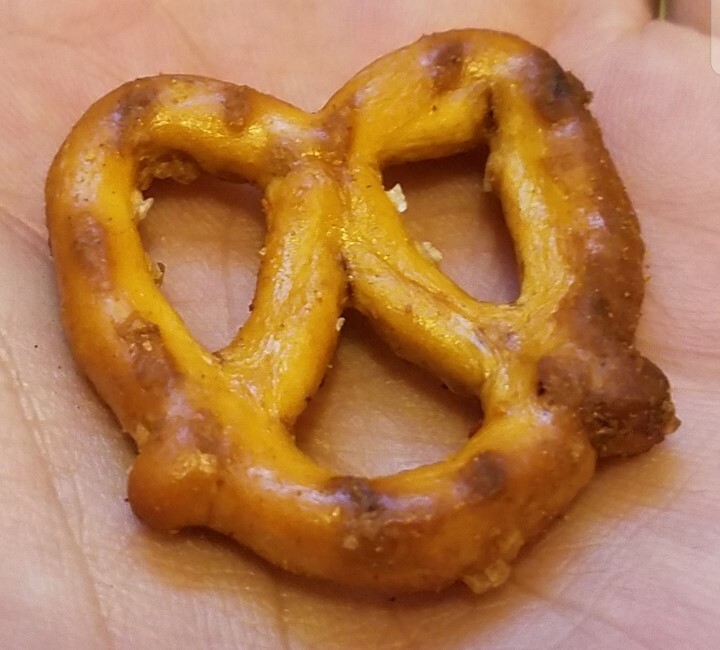 Seemed like each mini pretzel had less THC than advertised; this was likely due to the seasoning being cannabis-infused, not the pretzels, which got trapped in the bag. Because of the seasoning and texture, there are limitations to incorporating these pretzels into other recipes. Nonetheless, be adventurous and experiment. Try finely grinding a few and topping on pistachio ice cream, serving with soup, or substituting for breadcrumbs when coating chicken cutlets. Perfect to add to a trail or snack mix, but hard to share with friends who don’t want to consume cannabis. Venice Cookie Company will always supply a fresh and tasty snack. When it comes to stable dosing, some of the (I assume) infused seasoning remains in the bag and their savory pretzels fall a little short. For $22, the price is a bit steep considering it didn’t produce the same efficacy as other edibles at the same cost like Kiva bars. Pretzels were $10 more than Punch Edibles or Sensi Chew, with a similarly listed THC count. Did produce pleasant effects, but I would probably choose this only if there wasn’t another more affordable cannabis-infused snack treat. When I eat VCC’s 100g Savory Pretzels, I think about the boring snack mixes served at parties and how much better they’d be with this seasoning. They’re crunchy, salty, spicy and full of bold flavor that makes eating hard to stop and dosing easy to measure. The high is mellow, possibly due to the less potent seasoning trapped inside the bag, and not overwhelming. It’d be nice to have additional information on cannabis sourcing, growing and extraction techniques, and a clear indication of which part of the food is cannabis-infused. This is a great option if you like savory over sweet, microdosing, don’t mind a heftier price tag, like setting your taste buds mildly ablaze, and have enough self-control to refrain from crushing the entire bag. Still, I feel that VCC could’ve aimed higher. I’ll be here all week, folks! Ready to try these cannabis-infused savory pretzels? Visit the GetNugg.com and search your local dispensary to have these edible treats delivered to your door!